President Ram Nath Kovind and Prime Minister Narendra Modi in their messages congratulated Lung Care Foundation for the feat and lauded the school children who participated in the programme. New Delhi: Over 5,300 school children today set a world record by forming the largest shape of human lungs at Thyagraj stadium here and entered the Guinness Book of World Records. The event organised by non profit organisation Lung Care Foundation and Petronet LNG was lauded by President Ram Nath Kovind and Prime Minister Narendra Modi. 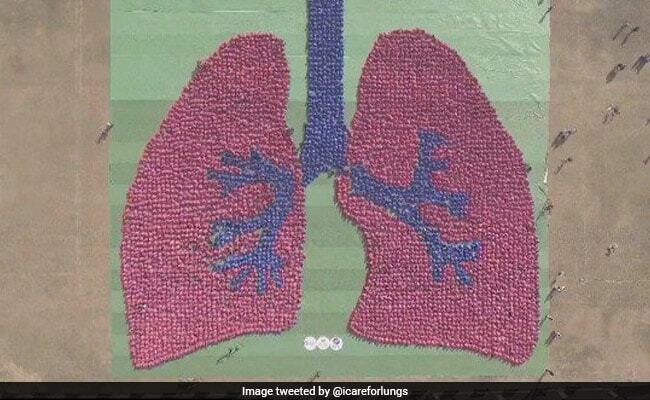 "Lung care Foundation and Petronet LNG have been awarded with Guinness World Record of creating the largest image of an organ(lung)," said a statement from the organsiation. Over 5,300 school children from over 35 schools in Delhi-NCR got together to set the record. The previous records were held by Beijing and Abu Dhabi, it said. The feat was aimed at creating awareness about harmful effects of pollution on lung health. Lt Governor of Delhi Anil Baijal, who was present at the event, said he was confident the campaign would help in initiating a people's movement for clean air. "In this regard, children are our best ambassadors for a positive change that we wish to achieve," he said. The President and the prime minister in their messages congratulated Lung Care Foundation for the feat and lauded the school children who participated in it, said the statement. "We believe it's time that the citizens themselves take care of their action and be responsible in their deeds," Dr Arvind Kumar, founder of Lung Care Foundation, said. With 1.2 million dead, India saw the world's most pollution-related deaths in 2015, he said quoting a Lancet Commission study.